← A summer solstice trail of standing stones – something to do this weekend….. Although I admit that I prefer Pilates to Yoga, I know there are many others that beg to differ. 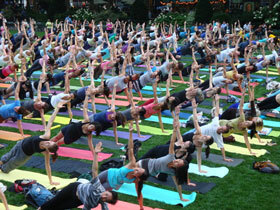 Weather permitting, I think this outdoor mass Vinyasa Flow yoga experience might be fun. ” The Sunset Session” will be an early evening outdoor class against the backdrop of the setting sun and led by expert Vinyasa Flow Yoga instructor Mercedes Ngoh and live capoeira musicians from Cordao De Ouro of London. This lively Vinyasa Flow yoga class will be fun, powerful and open to all who share a love of yoga. This entry was posted in London, Other London Things. Bookmark the permalink.